Personality: She's quiet to start off, but once she gets to know someone, she opens up. She has multiple mood swings, depending on what's going on. Yuuki also likes to be hugged, but she doesn't want people to know. Appearance: She has long blue hair and green eyes. She stands at 5 feet, 5 inches and wears "punk" clothing which usually consists of a short black skirt, a black tank top, black thigh high stockings, and black boots. And because she is forced to, she wears a red vest. For festivals in the her village, she usually wears a blue kimono. 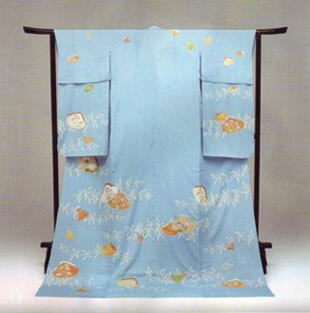 For one her birthdays, she gets a blue kimono with cherry blossoms all over it. Fighting Style: She's a graceful ninja girl. Her fighting moves are similar to dancing more so than fighting, throwing her opponent off with smooth patterns in her movements only to change pace at lightning speeds and catch them off gaurd. Sub Weapon(s): shuriken, kunai, fans. Special Equipment: Her talking puppy, Kyo. Special Attack(s)/Power(s): She can draw elemental energies into shuriken for variety in her attack types. -Surprise Blossom: A barrage of slashes so fast, only the final strike is visible. -Lotus Raising: Launch opponent into the air and follow up with a rising spin-attack. -Black Rose: Charge and release a wave of energy along the ground. -Kind Princess (Yuuki means "kind princess" in Japanese): Seemingly disappear for a lightening fast, distance closing blow. Hyper Ability/ies: She can perform seals to unlock her powers and lock them up, but that is only acquired after her boyfriend and bodyguard, Kousuke, is killed by a rouge member of her village. Background Story: Yuuki was born to Raizo and Kyoko Oosaka, who are the leaders of Shihana. As soon as Yuuki was born, she was assigned a bodyguard, who was the son of her mom's bodyguard. When Yuuki was five, her village was attacked, and her mom lost her life trying to protect Yuuki. Kousuke lost his father, too. After that, Yuuki was always seen in the company of Kousuke. On her seventeenth birthday, her father gives her a mission, and once she completes it, she will take over from her father. She goes on the mission and doesn't return. Then Kousuke searches for her and finds her in the company of a group of warriors(?). Likes/Dislikes: Like: Cherry blossoms, spring, chocolate, her friends, her puppy, sushi, and she secretly likes hugs. Hobbies: Beating up perverts, training with her friends, hugging her friends, visiting her mom's grave. Affiliation: She would side with whichever side Wolf sides with.